Gestational Diabetes is a kind of diabetes which is diagnosed in pregnant women, who were previously not diagnosed with diabetes. This is usually diagnosed in third trimester of pregnancy.GD usually affects between 4 to 10 percent of pregnant women. It occurs when the body does not produce enough insulin. Insulin is a hormone which breaks down body glucose to energy which is used up by body. During pregnancy, hormonal changes can make cells less responsive to insulin, which induces pancreas to produce more insulin. In some women, pancreas are not able to keep up with the requirement. When there is not enough insulin produced by body, blood sugar levels are not regulated as should be, thus increasing blood sugar level leading to GD. In most cases, GD goes away after delivery, but if you’ve had it, you are at a higher risk of getting it again. Can it affect the baby ? Gestational Diabetes is not harmful to fetus, as long as the blood sugar levels are controlled. but if GD goes undetected or if it remains uncontrolled and excess sugar is allowed to pass into baby’s circulatory system though placenta, risks for mother and baby can be enormous. Excess sugar if allowed to pass through to baby system, will induce baby’s pancreas to produce more insulin. All this can cause your baby to put on extra weight. Uncontrolled GD can lead to very large baby,a condition called macrosomia, which can complicate delivery. Babies with excessive fat due to excess sugars they receive from mother, can continue to be obese during childhood and adulthood. Women with uncontrolled GD are also at higher risk of pre-eclampsia (hypertension during pregnancy ). Uncontrolled GD can also lead to complications in baby, such as newborn jaundice, breathing difficulties and low blood sugar levels (hypoglycemia). Most women with GD show no symptoms. Some women may experience unusual thirst, frequent urination , exhaustion , presence of sugar in urine. 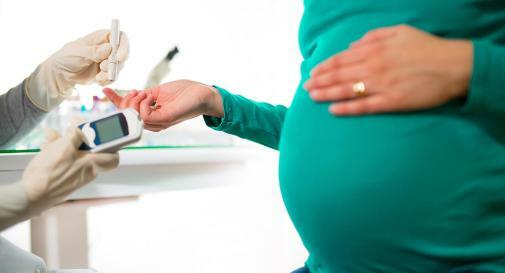 Who is at high risk of Gestational Diabetes? There is a strong history of diabetes in your family. Your age is over 35 at the time of pregnancy. You have a history of GD during previous pregnancy. You have had previous delivery, where you delivered a very large baby. At around 28-32 weeks of pregnancy, all pregnant women are subjected a glucose screening test, and if required , then glucose tolerance test. If you are at a higher risk of GD,your doctor may get you tested as early as in first trimester. If this happens, it is likely that you had undetected diabetes before pregnancy. If these tests show that you have GD, your doctor will put you on a special diet and possibly some medication, if it is not controlled by diet alone. Doctor may also suggest some specific exercises for controlling GD. Doctor will advise you get glucose tests done at regular intervals to monitor your glucose levels. How to control GD ? Good diet can keep GD at bay. Take diet rich in fruits and vegetables and whole grains. Take limited amount of sugars and refined foods. Regular exercise can keep your weight in check and thus reduce risk of GD. Keep an eye on your weight gain. If you were obese before pregnancy, you need to keep your weight in check during pregnancy. How to reduce risk of developing diabetes later in life ? You can reduce the risk of developing diabetes later in life by following a healthy lifestyle. Healthy diet, exercise and maintaining a healthy weight can much reduce the risk. Breastfeeding the baby can also cut the risk.